This post was definitely a work in progress. For some of the answers please see the next posts, especially Part 4. I have kept this post because it shows how the different geometries are almost the same, and how they were used in similar ways. Here is a simple farm house c.1840, about 40 miles north of and 10 years newer than the house in the last post. I know the house quite well, and have measured it. As is clear in the photograph it is well sited, with graceful proportions, a late Georgian cottage at a time when more urban houses were Greek Revival. The shutters are updates. It is in the Merrimack River watershed, as is the Locke Tavern - see previous posts. I wondered if the Golden Section used by the Tavern had perhaps migrated with a house wright up river to be used here. Or whether the builder used a variation of circle geometry, or maybe, due to the advent of the Industrial Revolution, neither. 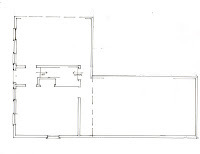 The floor plan shows the main house with walls and stair. The back wing is indicated only by its exterior walls since the inside has been extensively remodeled. It was probably a summer kitchen, shed and storage space, the covered way to the barn. There is no fireplace. A chimney was most likely beside the stair. A modern stack is now outside the original footprint. 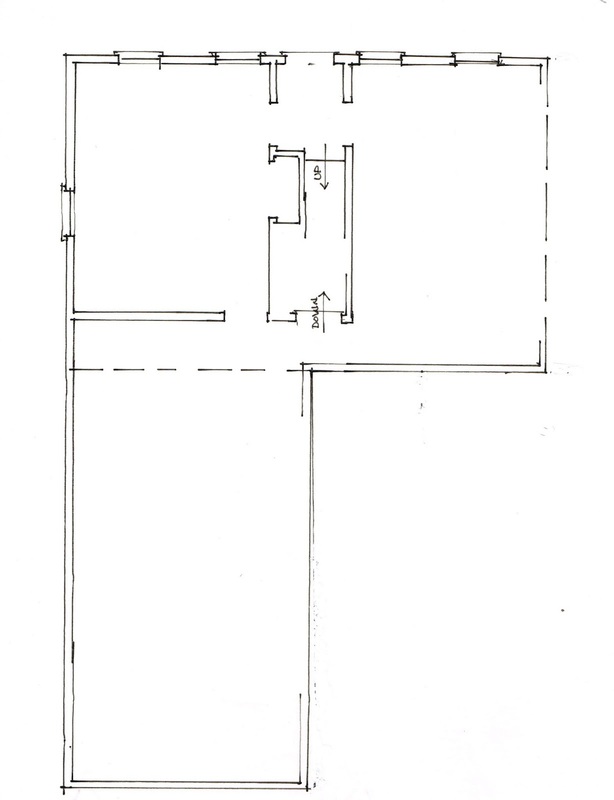 When I think about the geometry I also think about the owner and the house-wright. This small house has 7 ft. ceilings on the first floor and little windows. It lacks the frills the owner would have seen on other houses in the neighborhood and on trips to market. 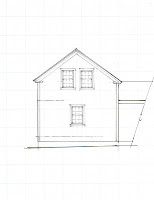 So I think the geometry used would have matched the house: bare and simple. The 2 circle pattern works here. The circles are within the frame. 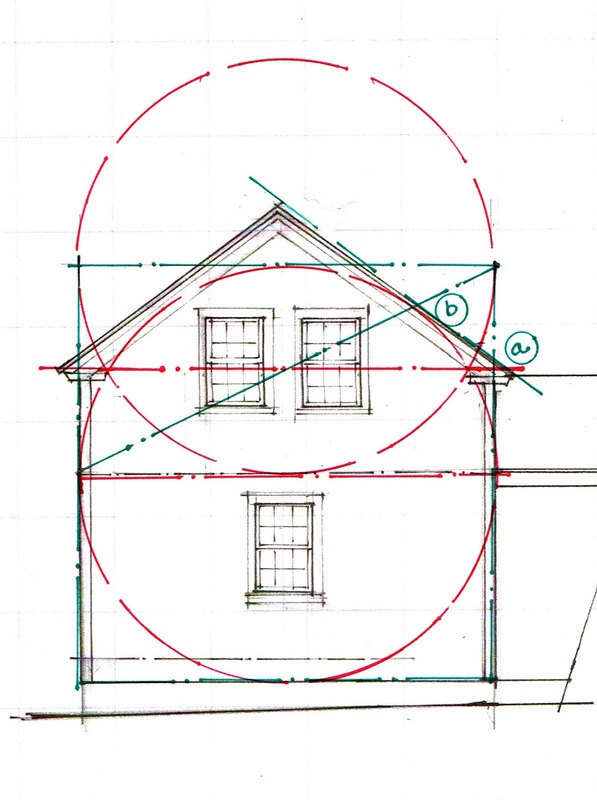 I think of the framer, knowing how deep the house would be, laying out the circles in his framing yard to determine its length and height. The interconnection of the proportions gives the house its grace. 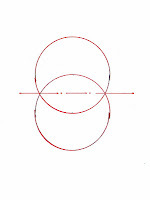 The intersection of the circles - the vesica piscis - is the middle of the house, the position of the front door - see 'a'. It also determines the width of the back wing - see 'a' - and the front windows' placement - see 'b' . I have drawn one of the squares which fits around the circles - the green x. The front hall walls and the left front windows - see 'd' in green - seem determined by the intersection of the diagonal of the square and the the circle. The side window - see 'e' in green - is centered by the circle and the square. 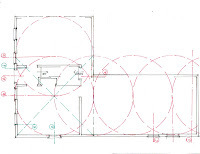 The shed's width follows the geometry of the main house, but its length doesn't quite - Two of the windows in the shed seem to determined by the circles' intersections - see 'c' in red. I wonder if my dimensions are off: the house is swathed in vinyl. The main wing has been expanded which makes accurate measurement of the original size somewhat problematic. The back wing has been rebuilt at least twice in the last 170 years. The length of the wing is off by about 12". If my circles are 4" too small, or I've missed the extra thickness of a plumbing wall, the geometry fits. Or as I found out, I was using the wrong geometry! 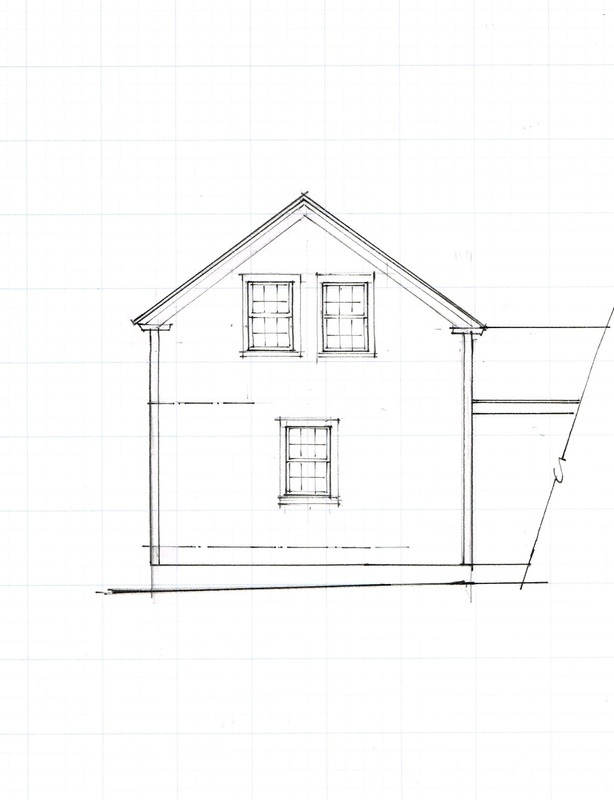 Unlike the 1830's house which used one geometry for the plan, another for the elevation, this house uses the same pattern for both. 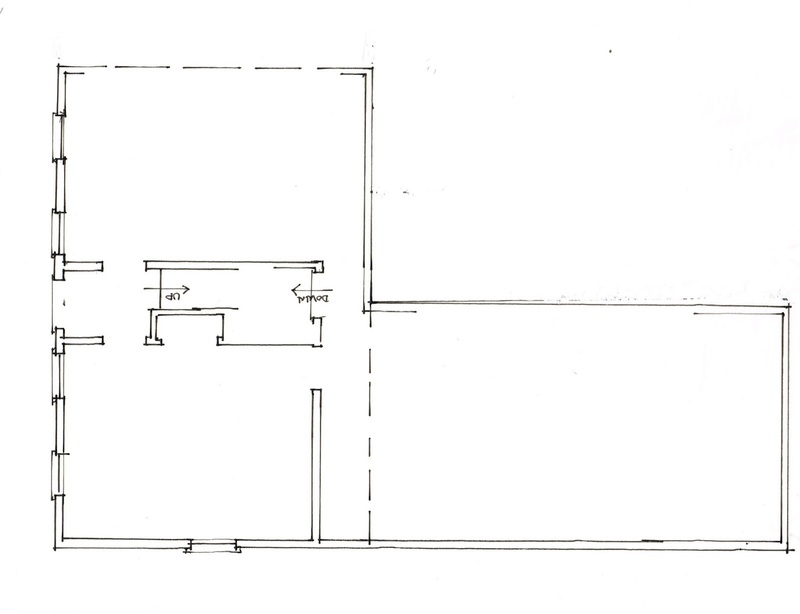 Here is the side elevation with dot and dash lines to indicate 1st and 2nd floors. 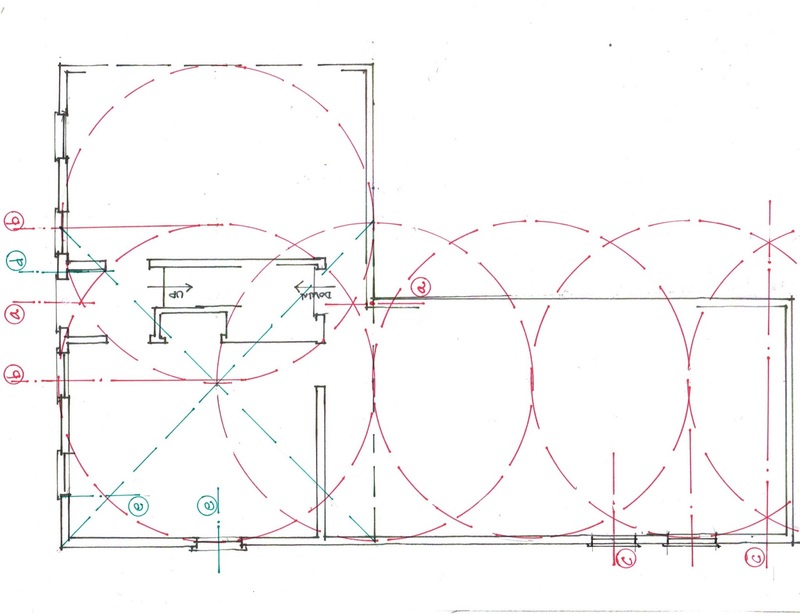 The red circles are the two circle configuration that was used for the floor plan. Here the intersection of the circles marks the height of the front and back walls, the beginning of the roof. The center of the circle marks the placement of the 2nd floor; the top of the circle, the collar ties for the roof. 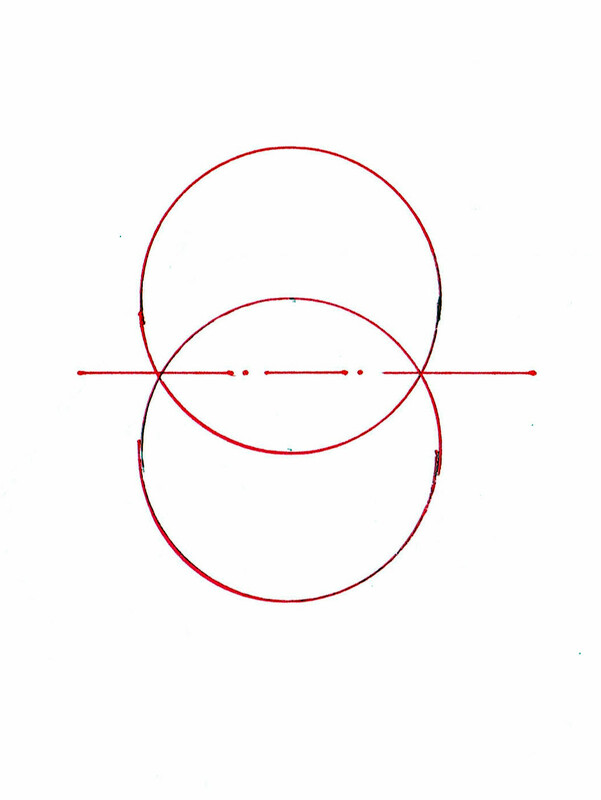 The top of the wall , which is also the centerline of the vesica piscis, is obviously the beginning of the roof , therefore, one point - see 'a'. If the square of the house is divided in half and a diagonal drawn - see green square, rectangle and diagonal - a second point is determined by the intersection of the diagonal and the circle - 'b' in green. The line through 'a' and 'b' is the roof slope, about a '9/12 pitch' in modern terms. Does the geometry determine the design or the structure? In this case I think both. Why doesn't this geometry show up in the pattern books? Was it just something that was common knowledge? Or was it passed from master to apprentice as privileged knowledge? Please forgive me, I think I may have asked you this before, but can't remember if you responded. Have you read "The Power of Limits" by Doczi? You may enjoy having a copy if you don't already. I enjoy reading about what you are thinking about. I haven't read it yet. There is a copy in a local college library. I want to take a look before I buy a copy. I'll let you know when I have. I always like a new book to check out - someone else's ideas on something I care about!